What is Shoes With Heart? ShoesWithHeart is a Funds2Orgs brand. ShoesWithHeart is a social enterprise. It works with churches, nonprofits, schools, and others to help them achieve fundraising success with shoe drive fundraisers. It just means to give a new purpose and an extended life. Micro-entrepreneurs clean shoes that are given to a shoe drive fundraiser in North America and prepare the footwear for sale in developing countries around the world. In other words, the shoes are given a new lease on life in developing nations as inventory for micro-enterprises. What should we do when we receive shoes during the fundraising campaign? The shoes must be rubber banded together or the laces tied to prevent the pairs from separating. The pairs should be placed in the 33-gallon clear bags that ShoesWithHeart provides in the Starter Kit. Each bag must be filled with 25 pairs of gently worn, used and new shoes, and then the bag must be tied with a knot. Why do I need to rubber band the pairs of shoes together before being placed in the 33-gallon clear bags? Shoes must be kept paired, same size, style and laces tied or the pair rubber banded together to ensure accurate processing. What happens if we need more materials than what is in the Starter Kit? Once you fill 35 bags with 25 pairs of gently worn, used and new shoes, please contact your fundraising coach. Your fundraising coach will order your organization another set of supplies, or you can order a kit on our website. Are there restrictions on the types of shoes that can be collected? • No thrift store shoes are accepted. Can someone give a single shoe? We do not accept single shoes, only matching pairs of gently worn, used and new shoes. How often will you collect my shoes? During your shoe drive fundraiser, your fundraising coach and the Funds2Orgs Group logistics team will be in contact with you. We cannot guarantee any pickups during your fundraiser other than a final pickup within 45 days of the end of your campaign. Please make sure you have a storage space large enough to hold all your bags for the entire duration of your shoe drive fundraiser and until pickup. However, we may arrange for periodic pickups when our team is in your area. Micro-entrepreneurs are small business owners. Micro-enterprises are small businesses that are started with, typically, low investment capital. These micro-enterprises are run by one person or a few family members or friends. Funds2Orgs Group works with micro-entrepreneurs in developing countries to provide them with inventory to sell so they can make a living wage for themselves and their families. Because of systemic poverty, few work opportunities provide sustainable incomes, so many must create their own opportunities selling merchandise and products in their communities, including shoes. Why aren’t shoes given away in developing nations to help people living in poverty? As a social enterprise, Funds2Orgs seeks to be socially responsible. If Funds2Orgs simply gave the shoes away to people in developing nations, it would destroy commerce, which is not benefiting the people the shoes are meant to help. In addition, some developing countries have laws that prevent products from being given away precisely for this reason. Therefore, Funds2Orgs Group sells the shoes collected in shoe drive fundraiser for a minimal investment by micro-entrepreneurs in developing nations, who resell the footwear and make a profit. Can I choose a specific country or region where my shoes will be shipped? Unfortunately, no. Shoes you collected are combined with other shoes from other shoe drive fundraisers. The shoes collected from shoe drive fundraiser throughout North America are consolidated and sent overseas. What happens if we need more time than our deadline to reach our goal? Funds2Orgs Group will pick up the shoes that you have collected, and you will need to sign a new agreement and start a new fundraiser. How do the shoes get picked up? Do we need to have volunteers to help load the truck? During your shoe drive fundraiser, our logistics team will work with you to coordinate a pickup of the bags of shoes collected by your organization. When there is a pickup, please have two to three volunteers on hand per 100 bags to help ensure timely loading. Please remember our drivers cannot control traffic or inclement weather, so please give our driver 30 minutes before the appointed arrival time and 30 minutes after to allow our driver a sufficient time for loading. Our driver will be in touch with you to confirm arrival time. What types of organizations can participate? Can individuals do a shoe drive fundraiser? Nonprofit organizations, churches, schools, PTO and PTA groups, businesses, companies, and civic groups can participate. We work with all types of groups and organizations, and we’ve also had individuals and families partner with us for shoe drive fundraisers pay adoption costs. When will we receive our funds? Once your shoes are received at our warehouse, they will be weighed and processed within 2 business days. You will be issued a check and receipt at that time. If we happened to be in your area and did an interim pickup, you will receive a check after processing of the shoes and then again at the end of your shoe drive fundraiser, after the collection and receipt by Funds2Orgs Group of all the shoes. How fast can I earn money if I start a shoe drive fundraiser? We have different options, so it’s always best to contact a fundraising coach at 407-930-2979. However, in general, we have had partners that have made $1,000, $3,000, or more in 60 to 90 days. Once you’re ready to start, your fundraising coach will work with you to determine the best type of shoe drive fundraiser for you. What happens if we collect more shoes in more bags than was our goal? That’s great! More shoes = More money for your organization. Are there any up-front costs to participate in a Funds2Orgs shoe drive fundraiser? No. ShoesWithHeart will provide all the shoe drive fundraising materials including 33-gallon clear bags, rubber bands, marketing material templates, and coaching for the duration of your shoe drive fundraiser. However, if you choose to do any printing from our marketing templates, you will be responsible for those costs. What if we don’t collect the minimum number of shoes? Please refer to your Shoe Drive Agreement (SDA) for additional details, or speak with your fundraising team by calling 407-93-2979. What happens with the shoes after they are picked up? They become an economic lifeline for individuals and families living in developing nations. Due to systemic poverty, lack of education and economic opportunity Funds2Orgs Group works with individuals who create micro-businesses, essentially small businesses. The shoes collected in countries, such as the United States, are repurposed. That is, they’re given another life and sold to micro-entrepreneurs for a small cost. Micro-entrepreneurs then mark-up the shoes and sell them in their local communities for a fraction of their original price, but still for a profit!. Can a wholesaler or shoe manufacturer sell hash lots or store returns? For more information regarding wholesale/ manufacturer sales, call 407-930-2979, our main office to speak with our Chief Fundraising Strategist, Tom Henderson. We’re ready! How can we get started with Shoes With Heart or get more information? All you have to do is give a Shoes With Heart fundraising coach a call at 407-930-2979. If you want a coach to call you, please fill out our contact form by clicking here. Instead of asking your donors to write you a check or pull out their credit card, a shoe drive fundraiser engages your supporters in a fun and easy way. During a shoe drive fundraiser, you ask your community to collect gently worn, used and new shoes. When ShoesWithHeart receives and processes the shoes collected from your shoe drive fundraiser, you will receive a check! What is the Funds2Orgs Group? The Funds2Orgs Group is the parent company of our four shoe drive fundraising brands, each targeted toward a particular niche: Funds2Orgs, Sneakers4Funds, ShoesWithHeart and Cash4Shooz. What are the benefits of doing a shoe drive fundraiser with ShoesWithHeart? There are four key benefits: 1) You engage supporters to raise funds without ever having to ask them for money. 2) Shoes are repurposed in a socially responsible fundraiser and are re-purposed in a developing nation. 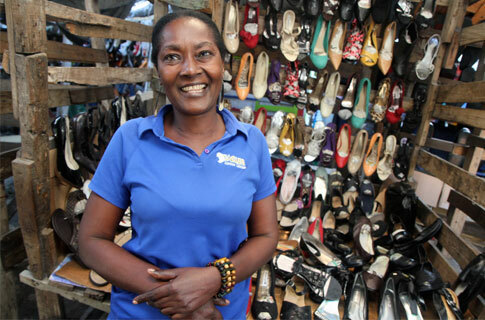 3) Shoes collected ultimately become inventory and an economic lifeline for micro-entrepreneurs in developing countries who sell the shoes in their small businesses for a living wage. 4) Our shoe drive fundraising company also provides American jobs for people living in the United States. What materials do you provide for my shoe drive fundraiser? During your shoe drive fundraiser, your coaching team will be providing ongoing support for the planning and execution of the campaign to ensure your success. We want your group to succeed! What condition should the shoes be in to be accepted? The shoes given for your shoe drive fundraiser should be gently worn, used and new. Of course, we always love to repurpose shoes that are in the best possible condition. And, we love new shoes best of all! How much space should we allocate for a shoe drive fundraiser? You will need a space roughly 10’ by 10’ by 10’. Some groups get a self-storage business to donate the space. A double car garage or a warehouse also provide sufficient space. How much do we get paid for the shoes? We’re not like other shoe drive fundraising companies. We believe one size does not fit all. We have several programs, so the best thing you can do is to contact a fundraising coach at 407-930-2979 so we can make certain we understand your goals and provide you with the best program so you can earn the most money.